A Chinese man, who was severely disfigured when he was electrocuted, hopes the growing “head” bulging from his chest will eventually become his new face. Yan Jianbin sustained serious facial burns and lost an eye and his nose after he opened the door of a high-voltage transformer, according to the Daily Mail. 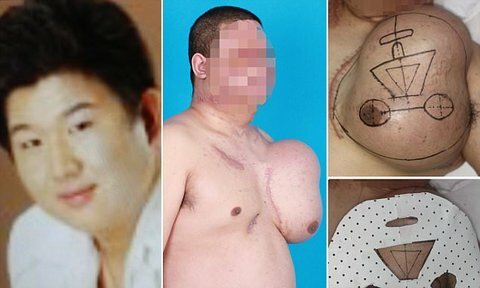 Doctors at Shenyang Army General Hospital, in Liaoning Province, began a procedure six months ago to stretch the skin on his chest by injecting saline water to create a head-shaped mound. Plastic surgeons plan to create new facial features and then attach the stretched skin to his face in a five stage procedure that will take two years to complete. The first two stages of the groundbreaking procedure involves creating a new nose using part of his rib cartilage. In the third phase, they will create new blood vessels and arteries. The fourth phase will be the face transplant. The final phase will consist of fine-tuning the new face.